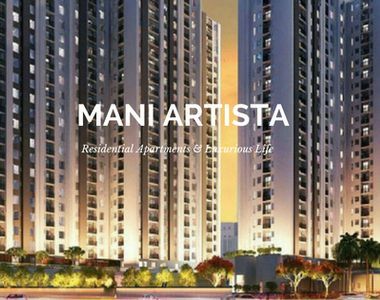 If you are willing to buy a classy home in Kolkata, have a look at Mani Artista, one of the upcoming projects in Rajarhat. The residential complex will come with luxurious apartments for the homeowners. If you are interested in buying these homes, you can book the apartments now. Kolkata is one of the most popular residential hubs in the country. The city has got a refined traditional heritage. The social infrastructure in Kolkata is well-developed. The city is also known for its commercial importance. Homeowners interested in buying these apartments should make their investment now. The prices of these properties are likely to increase in the coming months. Investors from various parts of the country are interested in buying these apartments. You will love the living infrastructure in the complex. The residential complex is strategically located in Rajarhat, enabling the residents to get across the important places in the city in quick time. The government and public transportation system in Kolkata is well-developed. The upcoming metro project in the area will connect Rajarhat to the other important areas in the city. These are likely to escalate in the coming months. Buy an apartment in the complex and live up to your housing dreams. The apartments are spacious and come with a wide range of luxurious lifestyle and healthcare amenities. The wide balconies and large windows in the apartments ensure good ventilation. The estate will be having green living facilities as well, and you can enjoy the green cover in the complex. The residents can have a stroll in the walkways in the landscaped gardens, or sit in their balconies, enjoying the bliss of nature. The commercial importance of Kolkata is high, and this is one of the key reasons behind the high demand for apartments here. The corporate employees are looking for elegant apartments in Rajarhat. The IT hub of the city is located in this area, which enables the residents to enjoy the tremendous exposure to employment opportunities. The places of commercial importance around the city, like Park Street, Esplanade, Central Avenue, B.B.D. Bag and other areas can be easily reached from the complex. The residents can also get across to the important schools, hospitals and other social institutes in the area in quick time from the complex. The residential complex will be having a wide range of amenities for the residents. These include swimming pool, gym, various indoor and outdoor games and much more. The residents will be able to enjoy their time in the clubhouse in the complex. The children will have dedicated play areas to enjoy their time. Besides, the complex will have a powerful security system, with CCTV cameras in the common areas. The residents can organize meetings and conferences in the banquet. Investors and homeowners willing to get an apartment in this residential complex should make their investment now. 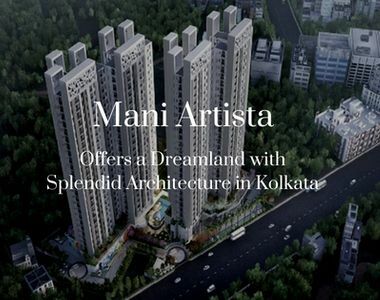 Buy an apartment in Mani Artista in Kolkata and enjoy your housing aspirations. You can cherish the green living facilities in the complex, while you reside close to the commercial zones in Kolkata. IT Commercial Hub - 0.5 Km*. Tata Medical Centre - 1 Km*. DPS and New town - 1.5 Km*.